The earliest formal meeting of Spiritualists in Gloucester is recorded in Kelly's Directory of 1939, which lists the Gloucester Spiritualist Church meeting in Russell Street. By 1959 it had moved to its present site in Montpellier, becoming known as the Gloucester First Spiritualist Church in 1981. It is the small building to the rear of the locked access, fenced and gated off. The National Spiritualist Church also have a meeting place nearby, in Brunswick Square, with a congregation founded in 1962. The above information was compiled with the assistance of the Victoria County History series: A History of the County of Gloucester, Volume 4: The City of Gloucester (1988), pp.292-335 (Churches and Chapels, &c.), and John Williams. Gloucester First Spirtualist Church, Gloucester shown on a Google Map. Information last updated on 1 Feb 2019 at 07:20. 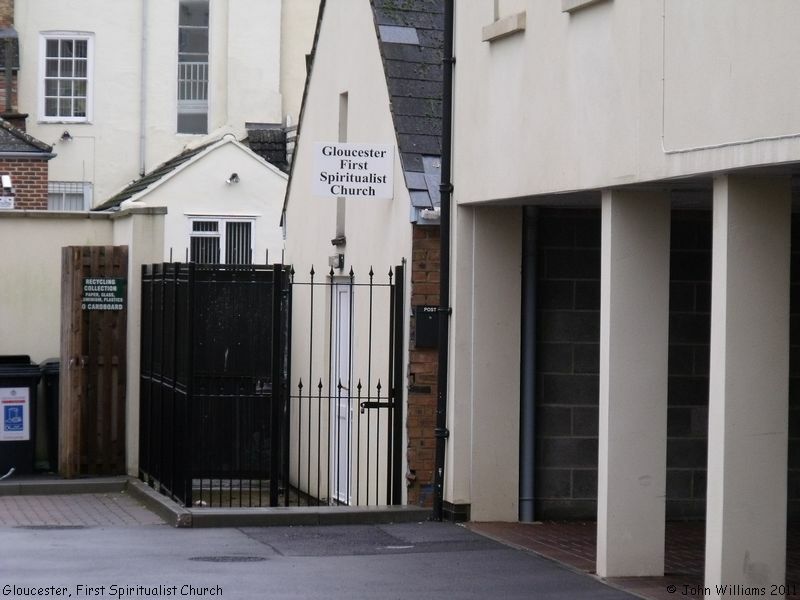 Please also remember that whilst the above account may suggest that Gloucester First Spirtualist Church remains open and accessible, this may not remain so. This Report was created 23 Mar 2019 - 10:46:36 GMT from information held in the Gloucestershire section of the Places of Worship Database. This was last updated on 7 Feb 2019 at 07:45.